Ground-R-Guides™ » Unitrack Industries, Inc. The Ground-R-Guide, with spring finger action found only in UNITRACK card guides offers exceptional grounding features. The OPEN STYLE Ground-R-Guide can be mounted to a chassis or motherboard with rivets, using the holes provided in the guide. Ground-R-Guide is available in three metals: phosphor bronze, stainless steel and beryllium copper. The firm grip afforded by the spring fingers develops a useful pressure contact over the length of the p.c. card for excellent electrical current passage. Large contact area of spring fingers provides a stable ground potential. TRACK STYLE Ground-R-Guide available for spanning open spaces. Spring fingers give a good shock and vibration dampening. Available to exact lengths to customer specifications or in long lengths for customer cutting. The TRACK STYLE Ground-R-Guide affords grounding for p.c. boards with the patented spring finger action found only in UNITRACK card guides. Pressure developed by spring fingers provides contact over entire length of p.c. card for excellent electrical current passage. Aluminum extrusion provides rigid guide for spanning open areas (often required for air circulation or cooling). Available to hold 1/16″ thru 1/8″ p.c. cards. Spring fingers provide shock and vibration damping. Guides up to 6″ long: 2 holes, or 2 studs spaced 1/2″ from each end of the guide. Guides up to 10″ long: 3 holes, or 3 studs evenly spaced with the end holes or hardware 1/2″ from each end of the guide. Guides over 10″ long: 4 holes, or 4 studs evenly spaced with the end holes or hardware 1/2″ from each end of the guide. 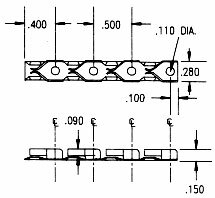 Example: UNSS1008-6 would be an assembled unit of: 6″ long GB1008 Guide Bar; one 5.5″ long SS1000 Stainless Steel card guide and two MC1000 mounting clips. Mounting hole centers would be 6.375″.